Rhode Island’s boatbuilding legacy is set to receive a boost after the US America’s Cup team, American Magic, announced plans to open a dedicated construction facility in the town of Bristol. 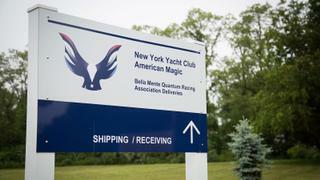 The new facility will be tasked immediately with building two AC75 class boats for the American team New York Yacht Club American Magic. A new design for the 2021 event, the AC75 is a 23 metre mono-hulled boat that utilises advanced hydrofoils to sail largely above the water. Under the rules of the event, each team will be allowed to construct two AC75s prior to the America’s Cup with the competing boats racing with a crew of 11 sailors each. It is hoped the move will attract design and engineering talent to the state while strengthening the local marine industry and continuing Bristol’s boatbuilding legacy. Alongside design and building, the plans will also see America’s Cup sailing activity return to Bristol with American Magic planning to test their AC75s on the waters of Narragansett Bay in the lead up to the 2021 America’s Cup. Rhode Island has a long tradition of America's Cup boat building with the first, Vigilant, constructed by the Herreshoff Manufacturing Company in 1892-93. Many more defenders would go on to be designed by local naval architects Nathaneal Greene Herreshoff and Starling Burgess and built by Bristol's Goetz Composites and New England Boatworks.